Famous for its long white sandy beaches overlooking the crystalline sea of the Golfo dell’Asinara, Badesi is a lively town in Northern Sardinia that marks the western edge of Gallura on the border with Castelsardo. 360° view over the Golfo dell’Asinara, from Isola Rossa to Castelsardo, with Corsica on the horizion: welcome to Badesi. An independent municipality since 1969, the Badesi area extends as far as the banks of the river Coghinas, a natural border between the Gallura and Anglona regions. The beauty of the beaches and the dunes in the shade of spectacular juniper bushes fascinate tourists and visitors, won over above all by the warm hospitality offered by the locals. 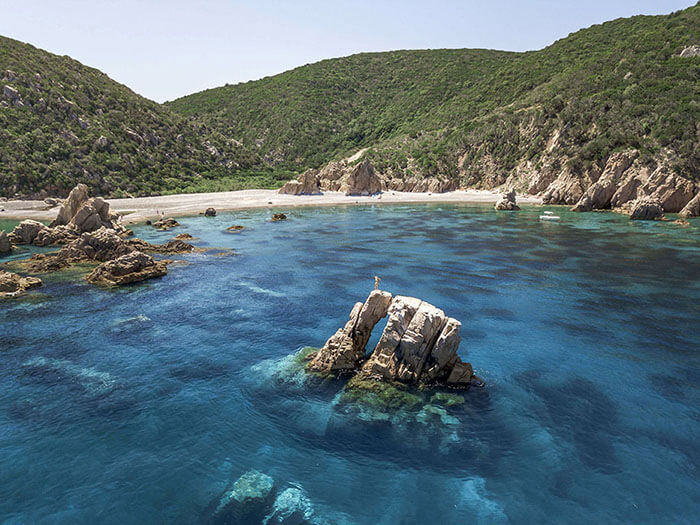 Badesi has an extraordinary tourist vocation that over the years has led to the development of facilities and resorts for families, hotels on the beach, bars, clubs and lots of watersports and activities that liven up holidays in this corner of Northern Sardinia every summer. And if there is nothing better than a good glass of wine with new friends, wine in Badesi is a serious business! In fact, the vineyards that cover the surrounding hills produce a very fine red wine and the famous Vermentino di Gallura DOCG. 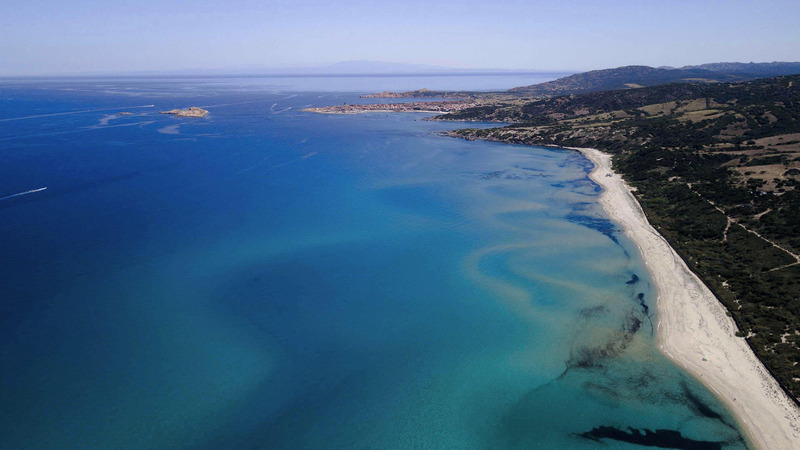 The bMarina di Badesib is different from the Eastern side of Gallura, which is dotted with numerous small coves. 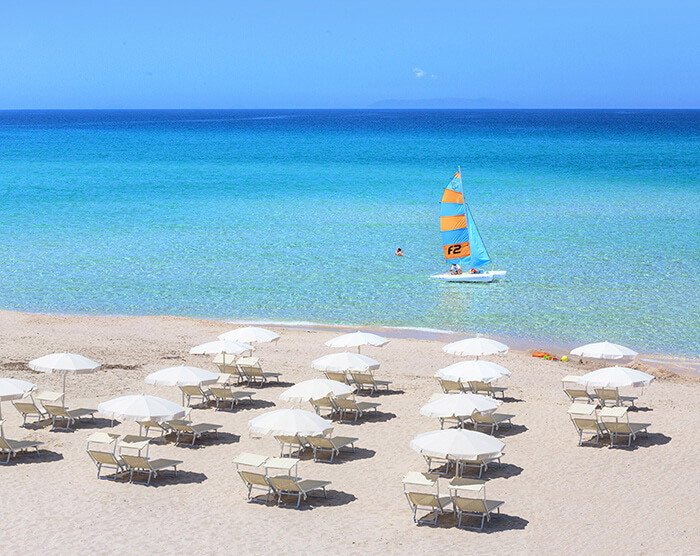 To understand what the bBadesi beachesb are like, think of long Californian coastlines … but with the warm, crystalline water of Sardinia and the fine white sand. After the cliffs of Isola Rossa and the beach at Li Feruli the long Badesi coastline starts with the beach at Li Mindi, the first section of a 12 km long stretch of sand that ends at Valledoria. Continuing along the beach we arrive at Li Junchi, the main Badesi beach which is 8 kms long and right in front of the Resort & SPA Le Dune. It is the most popular and best equipped beach on the entire coast, with snack bars, restaurants, shops, catamaran rentals, surf and windsurf schools. The Li Junchi beach has had a Bandiera Blu or Blue Flag since 2016 and in 2017 this award was also given to the beaches at Li Mindi and Baja delle Mimose. Among the beaches near Badesi that are worth a visit, we can’t leave out Isola Rossa with the Spiaggia Lunga and La Marinedda (both Blue Flags in 2017) and the fascinating Costa Paradiso with the beaches at Li Cossi and Cala Tinnari. To enjoy the beauty of this stretch of coast, the ideal solution is a boat trip to the Golfo dell’Asinara. Those who want to stay in the area or take a half-day excursion can choose the beautiful Costa Rossa and its fabulous bays where snorkelling is always a thrill! If instead you are feeling more energetic, you can book a day of sport fishing and spend exciting hours on the water. Whether with family and friends it’s a really great experience! Badesi is also a popular destination for surfing and windsurfing enthusiasts and together with the nearby La Marinedda beach is one of the most popular spots in Northern Sardinia. What’s more, in August and September the waves become the stage for exciting surfing contests where internationally renowned athletes come and compete. During the days when there is a light mistral wind why not make the most of it and take some lessons? And there’s no shortage of fun and entertainment! In addition to the Badesi and Castelsardo bars and clubs, beach parties and other events are organized during the summer months. The famous Badesi summer carnival is one of the most eagerly anticipated of these, involving people of all ages in a colourful festival of traditional Sardinian masks and parades featuring allegorical floats. Since Badesi is also famous for good wine don’t miss the chance of taking part in a wine tasting in some of the best known wineries in the area and don’t miss the many local festivals organized in the inland towns and villages. 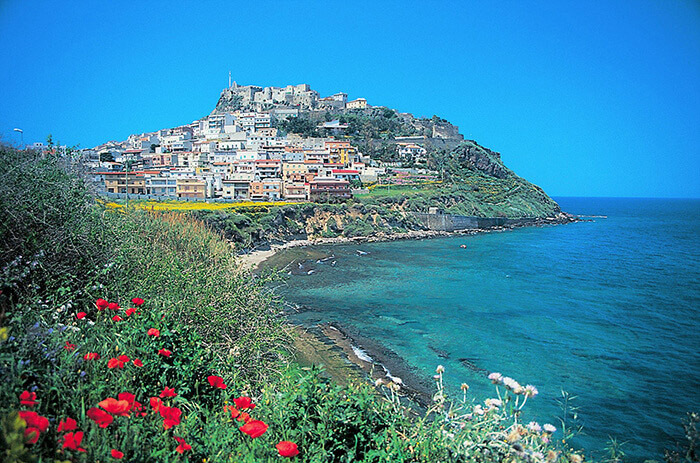 Just 20 minutes from Badesi, Castelsardo is a small jewel of a town right on the Northern Sardinian coast. A panoramic position on a rocky outcrop overlooking the sea and the narrow streets leading to the top and the thirteenth-century Castello dei Doria make this place unique. There is a mediaeval atmosphere made even more impressive thanks to the historic buildings and small craft shops where you can buy typical handmade baskets. One of the things definitely not to be missed during your holidays in Badesi is a visit/excursion to the mouth of the river Coghinas, a site of special community interest on account of the variety of flora and fauna. Here the most active and energetic can paddle up the river by canoe and explore the most important waterway in Northern Sardinia or ride along the nearby cycle path. Birdwatchers, on the other hand, can take a trip on the boats that go up the river and with a little luck, spot rare examples of local wildlife. Isola Rossa is a small fishing village that is well worth visiting for an evening walk. Famous for its purple-red coloured cliffs, at sunset it offers a romantic and charming atmosphere thanks to the bright tones of the sky and the reflections on the sea.